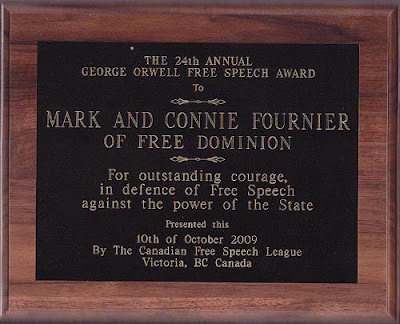 Last Saturday in Victoria, BC, Connie and I proudly accepted the 24th Annual George Orwell Free Speech Award from the Canadian Free Speech League. 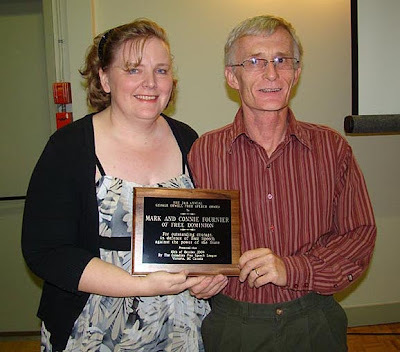 It was a personal pleasure for me to receive an award named for one of my literary heroes. I encountered the writings of George Orwell decades ago and they effected me so profoundly that they set me on paths of political thought that I continue to travel to this day. A variety of speakers at the annual meeting told the 125 people in attendance about their experiences of being crushed by the state. Marc Lemire did a power point presentation that gave an all too brief overview of what he has been through and brought everyone up to date on the latest developments in his case and the CHRC's appeal of the Hadjis ruling on the constitutionality of Section 13. A representative of the battle against the long gun registry spoke and a B.C. couple told a heart-wrenching story of having all their children seized by the B.C. government after a misdiagnosis of shaken-baby syndrome. 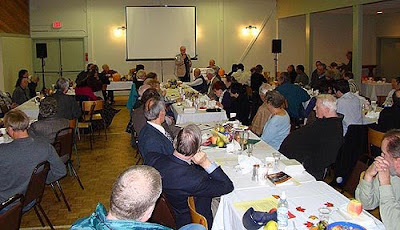 Arthur Topham spoke of B'nai Brith's CHRC attack on him and we heard a story from a gentleman who has been locked in a battle with the government of B.C. over busking, of all things. We also received a generous cash award which will go to our legal defense. The battle will go on. We will never look up to the face of Big Brother, and love him. This year's recipients were Mark and Connie Fournier, the former owners of freedominion.ca, a conservative website in existance since 2001. They have the unique distinction of being the victims of no fewer than three defamation suits at the hands of the ultra litigious Richard Warman, the chronic Canadian human rights complaints filer. For the past three years, the Fourniers and many of their posters have fought a staunch battle for free speech and found themselves being spied on by blind Canadian human rights investigator (don't ask how -- we don't know and he won't tell), even before a complaint was filed against their site. 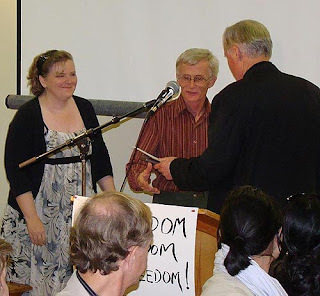 Representing the Canadian Association for Free Expression, Paul Fromm, the 1994 George Orwell Award winner, explained the travails of math lecturer Terry Tremaine, another Warman victim, who faces a preliminary hearing in Regina, October 19 on Warman-instigation Sec. 319 "hate law" charges about postings Mr. Tremaine made about Jews and national socialism. He was prosecuted under Sec. 13 on another Warman complaint and fined $4,000 and gagged for life (a "cease and desist" order) in 2006. Warman's complaints led to his losing his job at the University of Saskatchewan.